One of many great things of not being at work all day was that I got to try out some of the lunch-places I had been meaning to visit for a while. Even though a few of them were closed (looking at you here, Home Made and Nat’naa), many were not. 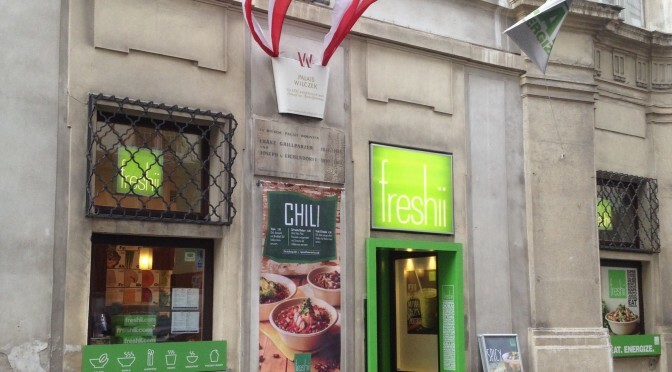 On one of my numerous strolls around the city I found myself steering towards Freshii, a small restaurant in the first district. All I knew was that it served salads, soups and wraps, with a fair chance of vegan fare. I picked a Baja burrito that seemed to be vegan but of course I double-checked when I ordered. „It is, but everything is prepared fresh so we can make everything on the menu vegan for you“. This was enough to make me like this place before I’d even laid eyes (or tastebuds) on their food. The burrito was tightly packed and filled with fresh- and goodness. Also, there were so many different kinds of vegetables in it that each mouthful had a different taste to it. YUM! I must also note that it was very well wrapped and didn’t fall apart, not even when I got to the last bites. Great plus! On the whole Freshii reminded me of Protein Bar where I had lunch a couple of times when I was in Chicago: You have an option of salads, wraps, bowls, soups, burritos as well as juices, smoothies and frozen yoghurt and – as I mentioned further above – all dishes (except for the froyo) can be made vegan upon request. You can also order extras such as falafel, tofu, chicken, steak or shrimp if you wish, or choose a base of quinoa (for meals that don’t already contain quinoa). I must admit that my burrito was filling enough without an add-on. On the other hand, falafel nearly always improves a meal no matter how great it would otherwise be. Now I only have to decide what to choose next time (leaning towards a vegan version of the Mediterranean bowl or a Thai Lemongrass burrito). 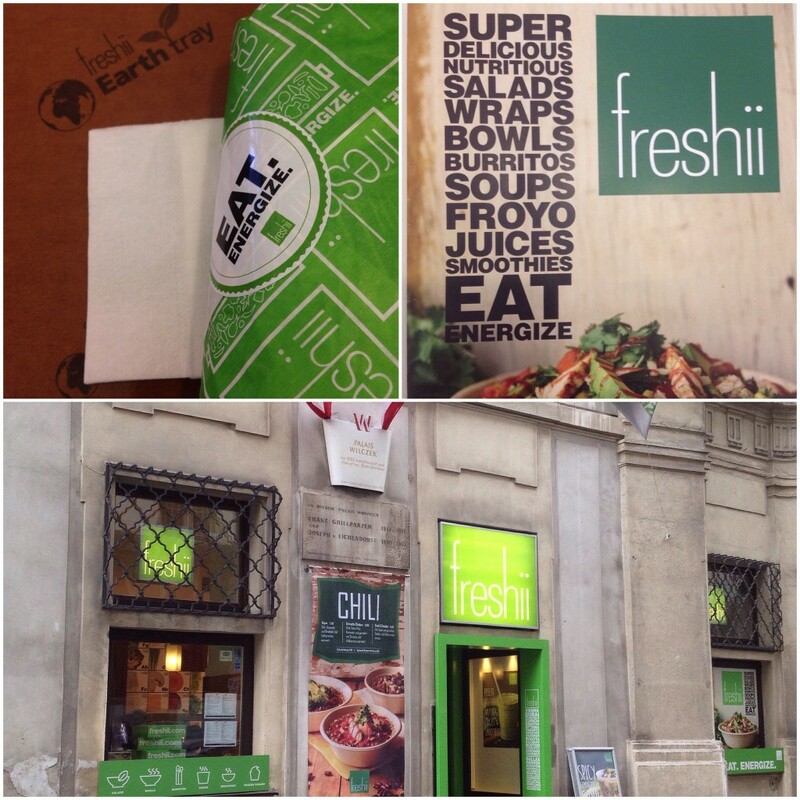 According to their Facebook page, Freshii is a Canadian fast-food franchise that currently has locations in 7 countries. Their motto is Eat. Energize. Have you ever eaten at one of their restaurants? How was your experience? Did you like it as much as I did? Really? I wonder whether it’s coincidence or if the name was chosen on purpose. Thank you for your insightful comment, Kuchunguza!